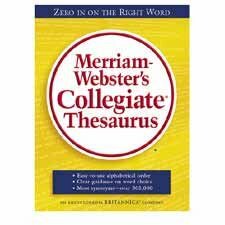 Collegiate Thesaurus offers more than 340,000 synonyms, antonyms, idiomatic phrases, related words and contrasted words. Easy to use, with concise definitions for synonyms. Entries are alphabetically arranged. Goldenrod linen cover, thumb-indexed. Hardcover thesaurus contains 894 pages.